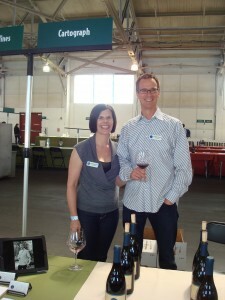 We spent Saturday 6/18/11 in San Francisco at Fort Mason pouring our 2009 Floodgate and Perli Pinot noir at the San Francisco Pinot Days grand tasting. We have not yet released the 2009 vintage so it was fun for us to hear people's thoughts on the wines, which we love and can't be more thrilled that 2009 was the year we made the leap into Northern California making our home and wines from the vineyards around us. Brandye Alexander took this fun photo of our Pinot noir as we were setting up. We poured the 2009 Floodgate Vineyard Pinot noir from the Russian River Valley, and the 2009 Perli Vineyard Pinot noir from Mendicino Ridge. Considering we pick these grapes at nearly the same time. their flavor profiles are wildly different owing to the classic foggy RRV days juxtaposed to the rugged mountain terrain and proximity of the Pacific ocean in the Perli Vineyard. We had great conversations about temperature inversion, slope, flooding, and other nerdy ag related stuff with the smart folks wandering around tasting Pinot. That passion for grape growing from the attendees is something we love about this crowd. Because the focus is on Pinot, we get to have really detailed and geeky conversations about the winemaking and growing conditions. 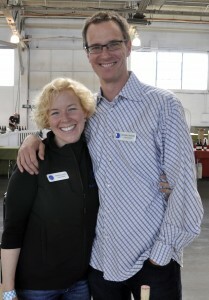 If we were pouring other varietals as well, we would not have had the time to go into such depth with folks. It was also so exciting to be able to officially invite everybody to come visit our tasting room that will be open in July downtown Healdsburg. So to all of our friends, old and new, and wine making friends who share our devotion to this amazing grape, cheers for making this a great event.